Good news: Eating healthy doesn't have to mean eating the same kale-and-avocado salad every damn day. 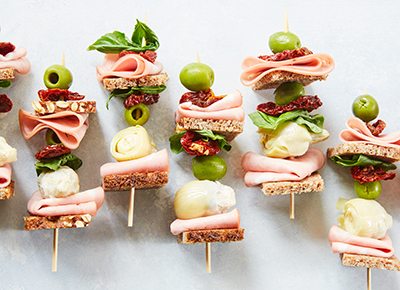 Mix things up with these bright, colorful and (mostly) nutritious lunches that are portable for work and taste great right out of the fridge. BLT pasta salad FTW. Finally, a sandwich you can make ahead (because it won’t get soggy). It’s impossible to resist this crunchy-and-creamy combo. Anything but a sad lunch wrap. These colorful boats will make your afternoon. Tip: Wrap these guys up in waxed paper to keep them extra fresh. Psst: You can totally assemble these the night before. Finger food is the best food.